Everybody on the internet seems to think Brooklyn’s all about expensive coffee and Instagram posing. But there’s still serious hot rodding going on out there. Step in to Tim Harney’s Bushwick motorcycle shop with us to see for yourself. As an upholsterer specializing in custom motorcycle seats and hot rod restorations, I visit a lot of speciality shops. Getting to know the builders is a perk of my job, and it helps me design seats that fit best physically and stylistically with unique vehicles. Of all the builders I get to work with, Tim Harney is one of my favorites. He’s a whirlwind of energy and always smiling. Tim jumps from one thing to another with an excitement for his work that’s infectious. As a kid he raced bicycles, and as an adult on all kinds of extreme machines he’s a real-deal hell on wheels. Traditionally trained in industrial design, Harney has worked at several architecture, furniture and lighting design firms. 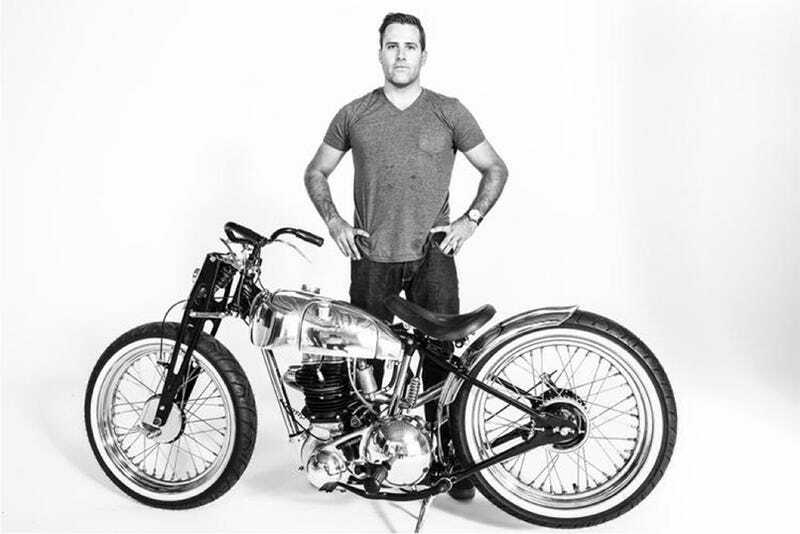 As a motorcycle builder he takes on any challenge from BMW to “Harney” Davidson. A skilled metal fabricator with a keen design sense, Harney reimagines practical elements of his vehicles in hand-hammered metal, and integrates them into a what becomes a streamlined form. “Harney Boy” bikes are fun, loud and fast while hanging on to some of their original elegance. You might have seen some of Harney’s builds at the “Handbuilt” show in Austin, Texas and the “Brooklyn Invitational” in New York. He has also been featured on Discovery Channel’s Cafe Racer TV with his “Frankenstein” 1997 GSX-R 1100 budget build. Check out the video and see how he does his thing. Corinna Mantlo has spent over a decade riding motorcycles and working in the industry. She is the founder and curator of Cine Meccanica, and a published authority on two-wheeled cinema. She is also the founder of The Miss-Fires, The Motorcycle Film Festival and the owner of Via Meccanica, a custom upholstery shop specializing in motorcycle seats.